Just after Calvin turned two we were on a plane returning from a visit with Michael’s parents. Mid-air, Calvin became pale, as if in shock, then he vomited and fell asleep. We figured he was just airsick. At home later, and just after I had fed him dinner, all color drained from Calvin's face. He slumped in his chair and, with a sour look, started gnashing his teeth and vomited again. I had seen this suspicious behavior a few times in previoius months and although it seemed perhaps he was ill, or might have eaten something that didn't agree with him, my gut told me differently. The next day the suspicious behavior continued until it finally culminated into an unmistakable seizure. We immediately dialed 911 and the medics arrived at our house in minutes. I don't remember how long his seizure lasted, but I do remember I was very frightened and concerned. In the emergency room I spoke with his pediatrician on the phone. She decided it was best to keep him overnight for observation. Our local hospital did not have a pediatric intensive care unit (PICU) so, after Calvin stabilized, they wheeled him upstairs to the ICU. Calvin was tiny, even for a two year old, and the ICU nurse couldn’t find a pediatric oxygen mask for his room. Her solution was to punch a hole in the bottom of a Styrofoam coffee cup, insert the oxygen tube through the hole and place it in the steel-barred crib near Calvin’s head in case he needed it. I was dumbfounded at her remedy, but what was I to do? 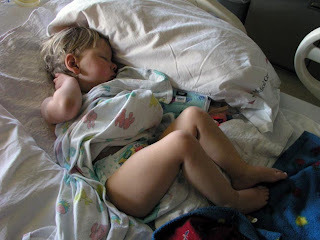 His pediatrician arrived and began examining him when he started to seize again. With her stethoscope to his back she said soberly "he's not breathing." I panicked. She yanked the oxygen tube out of the coffee cup, held it under Calvin's nose and sternly ordered the nurse to find a pediatric mask. Everything blurred and morphed into slow motion. An eternity later a mask was located. Calvin’s doctor placed it firmly over his mouth and nose and she began to squeeze the red, pleated bag inflating his lungs. The intensivist who had been called determined that Calvin needed to be intubated immediately—no time to wait for an anesthesiologist. A wall of white-coated figures encircled our tiny son as they placed him, wearing only his diaper, on a gurney. The intensivist began the procedure, feeding the clear plastic tube through Calvin’s mouth and pushing it into his trachea. Calvin began to scream—he was breathing. I was in shock and too ignorant to question the decision to intubate and, at the time, I had little choice but to believe that they knew what they were doing. Distressed and trembling—my child's muffled cries gruesomely echoing through my body—I wanted to run to him, but Calvin was fenced in. A nurse asked softly if I wanted to leave. Leave my child? And though Calvin was still breathing they continued their torturous mission. The doc tried several times to cram the tube down Calvin’s throat, but to no avail. Eventually he determined that the tube was too big. With my hot face buried in Michael’s chest, I turned to see the doc pulling out a bloodied tube as my baby arched and screamed and sputtered. To our horror, a second, smaller, tube was then initiated. Again Calvin shrieked in agony and tried to escape their restraint. In my terrified daze, my boy's stifled shrieks eerily commingled with the strange voices and sounds in the ICU. Lights and shapes shifted and blurred in my flooded, swollen eyes. Michael stood with stoicism—his tight embrace shielding me from our horror—but his eyes, too, were red and moist. Finally, the intensivist threaded Calvin's trachea. We rushed to his side as each white overcoat splintered off. Our baby boy was crying, hurt and confused, and I held him. I held him and I did not let go. Horrifying is a euphemism for what you endured. How agonizing when Western Medicine goes against motherly instincts. My mom and sister have gone through similar experiences and wondered since if they did the right thing. It's traumatic and soul-sucking to fear doctors might be causing more harm. As if it weren't hard enough already.